I was able to fulfill a childhood fantasy by taking a last-minute trip to watch the San Francisco Giants win the World Series without breaking the bank thanks to a couple of rewards programs. The trip wasn’t free, but I only paid about 20% of the advertised prices for all of my travel expenses. 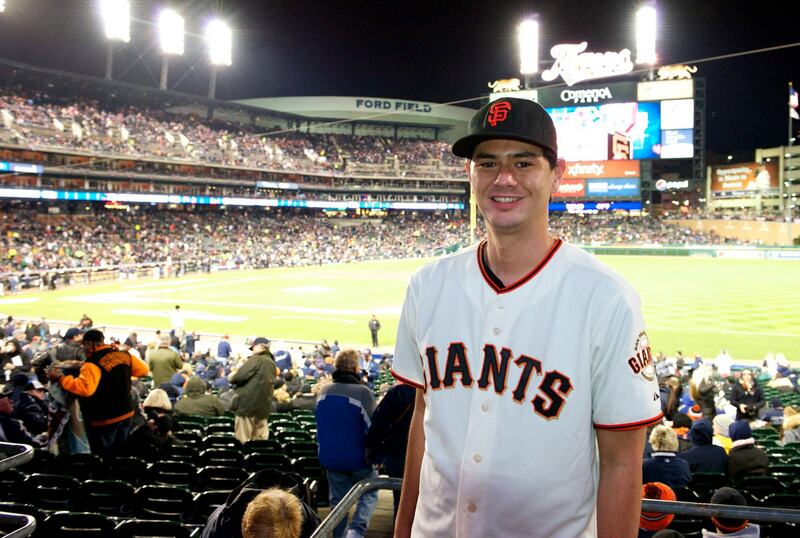 After watching the Giants win the first two games of the 2012 World Series live in my hometown of San Francisco, I was forced to watch game three while at a Halloween party. The TV was muted and a bunch of toddlers were the focus of the party, not the game. I caught bits and pieces of the game, but didn’t really get to watch it. As the game ended, I mentioned to my wife and a couple of friends that I’d always dreamed of watching the Giants win the World Series in person and that it was too bad the Giants were probably going to win game four the next evening in Detroit. I jokingly said I was going to leave the party for the airport, hop on a flight to Detroit to catch game four live. My wife said it was fine to leave her and my one-year old son at home and to go ahead and watch the game. So I left the party, went home to pack and plan my trip. A massive storm was blanketing the East Coast and heading towards the Midwest. Airlines had already cancelled a ton of flights throughout the country, which meant it was challenging to even find a flight to anywhere close to Detroit. 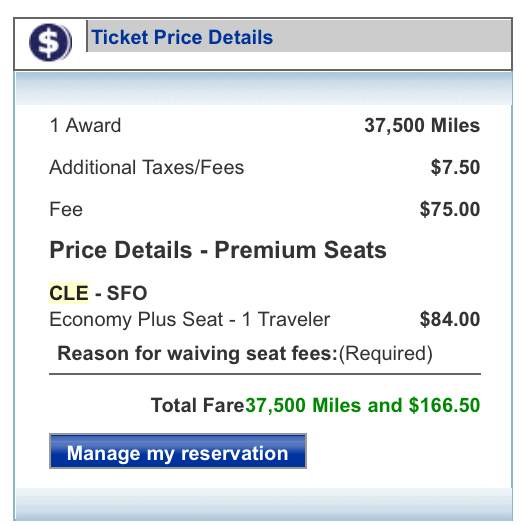 The only last-minute flight to the World Series that would work was to Cleveland and there was only one seat left on it – a single business class seat on United that was priced at over $900. The only return fight I could find for the day after game four cost about $600. Thankfully, I had a pile of United miles, so I was able to book the flight for 37,500 miles, plus $166.50. As you can see in the screenshot above, about half of the cash went to upgrading to Economy Plus on the way back to San Francisco. After I locked in the United reservation I went to work getting a cheap hotel room. I didn’t care much about how luxurious the accommodations would be,but wanted to be within walking distance of Comerirca Park, where the Tigers would take on the Giants. I was able to find a room at a Doubletree Suites about half a mile from the stadium, but like everything else to do with the World Series, prices were inflated. Hotels.com listed the hotel at $329 plus tax. I ended up paying just $17, plus the room tax since I had a $312 Free Night credit from Hotels.com for booking rooms for work travel through the site. Detroit is about 170 miles from Cleveland, so I needed a rental car. I booked a midsize car for $39.97, plus tax, which worked out to $57.40. The total out of pocket cost for my travel expenses for this trip was just $281.80, plus the United miles. The only thing missing from the mix at this point was a ticket to the game. I usually buy game tickets from StubHub, a marketplace for buying and selling tickets. Tickets ranged from as low as $90 to more than $2,000. While these tickets were expensive, they were actually quite a bit cheaper than before the Detroit Tigers lost game three. I settled on an Infield Box seat that someone was selling for $367. The service fee and tax upped the total to $409.15. 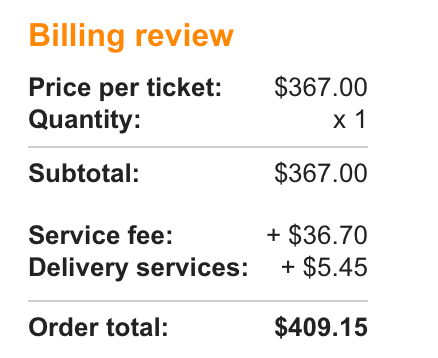 All-in, the price for my last-minute baseball dream trip was $690.95. That isn’t chump change, but it’s a lot less than what most people’s dream vacations cost. If it weren’t for my rewards miles and credits, the trip would have cost $2,500 and I wouldn’t have been able to go on it. After I booked the trip I only had a couple of hours to rush to the airport and catch my early AM flight. My wife couldn’t believe I was able to plan and book a trip for less than $300 between the time I left the party and the time she came home. Spending this kind of money was definitely a splurge, but the blow to my budget was really softened by the United and Hotels.com reward programs. It meant I was able to spend more on getting a great seat and watching my beloved Giants win the World Series up close and personal. I brought my good camera and shot the above picture of Ryan Theriot scoring the game’s winning run. So where did all those miles and Hotels.com rewards credits come from? For years I’ve used a United MileagePlus Visa Signature credit card, which means I earn miles almost every time I buy something. When I travel I generally fly United or one of Star Alliance airlines to earn miles. This is especially useful when someone else, such as a business partner or client is paying for my flights. I almost always book hotel rooms for both business and leisure through Hotels.com, which gives me one free night for every ten I pay for. The miles and rewards credits aren’t free, but they’re pretty close to free. Most people spend money and book travel without actively participating in rewards programs. Earning a few miles here or there might not seem like much when you swipe your card, but over months and years you can easily earn enough rewards to treat yourself to a dream trip. Just signing up for a new credit card can even be enough to earn a round trip ticket.